In his barbed review of Richard Linklater’s Boyhood (2014) Armond White stated the film celebrated the “emblematic figure” of white patriarchy. Céline Sciamma’s Girlhood (2014) could easily be the antithesis to Linklater’s expansive coming-of-age drama. An intimate and tender portrait of a young black girl realising the finite boundaries of her ambition whilst growing up in a deprived suburb of Paris, Sciamma’s latest is an adrenaline shot of socially aware filmmaking that’s an invigorating and perspicacious exploration of adolescence. Girlhood opens with a slow motion montage of an American football match – an explosive introduction you’d usually associate with emphatic displays of testosterone. Behind the plastic-coated metal bars of these helmets we discover the all-female cast of Sciamma’s latest study of teenage confusion. The strength of character and female solidarity shared on the pitch soon dissipates as the girls walk home, their voices quieting as they enter the dimly-lit Parisian projects in which they reside. As each girl separates from the pack, their courage gradually wanes, with the wolf calls from the boys lurking in the shadows reminding us of the oppressive patriarchy that surrounds them. Heading up this all-black cast is Karidja Touré, an amateur actor who shines as Marieme, the submissive tomboy living in a Paris council estate with her sisters and brother. Her life changes dramatically as a result of a chance encounter with a group of three fervent and tenacious girls. Marieme joins their gang, and in the process changes her name and how she dresses. She begins to carve out a new identity for herself, one that she hopes will afford her the courage and strength of character to escape her wretched domestic situation. Sciamma is a masterful storyteller with an outstanding ability to bequeath her compassionate studies of youth in crisis with an abundance of warmth and humility. A layered examination into the pains of adolescence, Girlhood‘s depiction of female solidarity is best observed during a remarkable scene in which Marieme (now known as Vic) and her friends sing and dance to Rihanna’s Diamonds. Filmed like a music video with the girls lip-synching the lyrics, Sciamma bathes her impromptu pop stars in an epinephrine flame that burns away their doubt and confusion. This scene is just one of many beautifully composed shots that submerge us deep into the subjectivity of these captivating characters. The immediacy rendered in the clean, unhurried precision of Sciamma’s framing enriches the physiognomy of her young cast, and when combined with her auspicious and enlivening deployment of music creates a truly mesmerising experience. Sciamma demonstrated a capacity for composing beautifully rendered representations of female adolescence with Water Lillies (2007) and Tomboy (2011), but this is a marked step up in her evolution as a filmmaker. 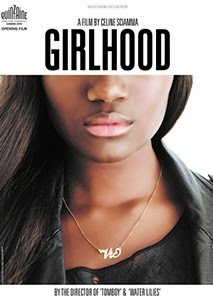 By exploring the various intersections between forms of oppression and discrimination, Girlhood‘s non-patronising and credible representation of class, race and gender is a rare and perceptive illustration of the intricacies of social inequality. By eliciting natural performances from her amateur cast and capturing the vibrancy and intimacy of her setting, Sciamma harnesses the specificity of both her characters and their surroundings. Over a decade into the 21st century, a film about black working-class girls shouldn’t feel so refreshing, it’s a damming incitement on the inaccessibility of contemporary culture that it does. Girlhood featured in CineVue’s ‘Best films of 2014’ feature. You can read the full list here.